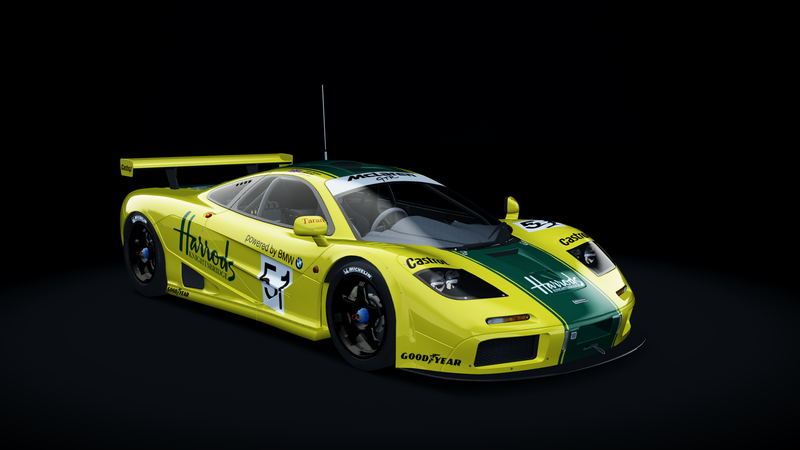 One of the iconic liveries for the Mclaren F1 GTR. No. 51 driven by Derek Bell, Justin Bell and Andy Wallace. Any comments or feedback welcomed. I try and be as accurate to original as possible, apart from the tyre textures which are not accessible. Kudos to http://www.virtualr.net/assetto-corsa-dream-dlc-pack-templates-released for the templates! ImWilde, Fidanza99, ajcrean and 6 others like this. Thank you so much, your render is amazing! This skins has already been done by Paul Terry at 22nd of March. I presume you missed it. Other than that, if original work from you, good job. But we have to be careful not to interfere with other people's work and do our research. I was already aware that another version of this livery had already been done, and cannot possibly see how it 'interferes' with it. There are many duplicates out there of various cars. As I am only able to do this during my very limited spare time, I do realise that I am usually not the first person to do a particular skin. They do start off as personal projects and a lot of thought, time and research goes into each skin. Because I am proud of my work, I like to share it with the rest of the community and am not actively asking users to download mine over anyone else's. I personally think its great we have a choice and don't think we should be discouraging modders.